Despite the uptick in news consumption in America, largely thanks to the Trump bump, the newspaper industry's survival remains in jeopardy, according to the Pew Research Center's newly-released newspaper fact sheet for 2017. The big picture: The future for newspapers remains bleak. Though web traffic has grown for many news outlets, the industry's subscriber-based audience has steadily declined since the 2000s, per the report. 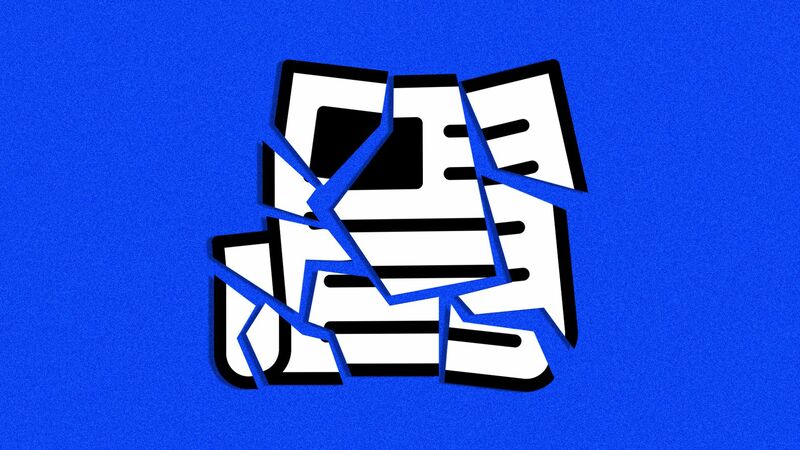 Meanwhile newspapers, which have failed at finding fresh ways to compete with digital products, are using antiquated business models that show no signs of improving their readership. Newspaper advertising revenue was $16.5 billion in 2017, down 10% from 2016. The estimated total U.S. daily newspaper circulation (print and digital) in 2017 was 31 million for weekdays and 34 million for Sunday, down 11% and 10% respectively in 2016. About 39,000 people worked as reporters, editors, photographers or video editors in 2017, per the Bureau of Labor Statistic’ Occupational Employment Statistics. That’s down 15% from 2014 and 45% from 2004. Be smart: Newspaper ads for digital are on the rise, and accounted for almost a third of ad revenue in 2017. That’s only up 3% from 2016, but it’s a number that stayed out of the red. Take note: Many daily newspapers do not get enough web traffic to be recorded by comScore, the data source used by Pew, so the figures in the report are more reflective of the top 50 U.S. newspapers based on circulation.